Trick or Treat! Halloween is almost here! Costumes are being picked! Candy favorites are being voiced! Parties are being planned! 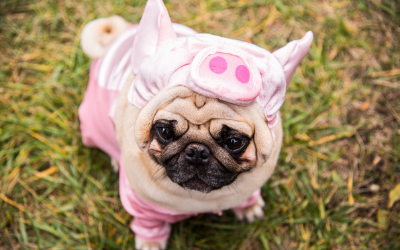 Halloween is such a magical time of year for children, but what about your pets? Some pets are oblivious and don’t mind the sights and sounds of Halloween, while others have a hard time of it. Some dogs bark with every knock on the door or shout of “Trick or Treat!” and some cats try to escape – either through an open door or under the bed. Halloween can be overwhelming for cats and dogs, so here are some tips to make sure that Halloween is safe and enjoyable for everyone in your home. Keep decorations animal friendly. Watch where you put the candle lit Jack-o-lanterns. With the swipe of a tail, they can become a fire hazard. Be mindful of where you place the spooky spider webs – both in and outside your home. The fake webs can get caught in fur, faces, and paws, and depending on how they are hung, can pose a danger to migrating birds and butterflies. Secure your pet. While it might seem fun to dress Fido up in a unicorn or dragon costume and have him “help” give out candy, he might become anxious or territorial with the constant barrage of knocking and shouting “Trick or Treat!” – not to mention the strange creatures on the other side of the door! Keeping your pet somewhere safe in the house, like a bedroom or basement, with the television or radio playing, will not only make the evening easier for your pet, it will also prevent a spooked cat or dog from escaping out an open door. Leave your dog at home. Any opportunity for a little extra exercise for Fido is great – but maybe not while you are out and about on Halloween with your kids. The extra people and all those strange costumes could cause your dog to become agitated. You know your dog best and know what he can tolerate. If you decide to take your dog with you, make sure he is on a leash, keep him close to you, and keep him under control. The commotion of children bustling about in strange costumes, chatting and calling out, may cause a usually friendly dog to bark, growl, or snap at children or other dogs. No sharing of candy! Make sure to keep the candy out of reach of your pets. Pets can be curious, and the smell of candy enticing! Chocolate is toxic to both dogs and cats, and can cause vomiting, diarrhea, tremors, and seizures, and at times be fatal. Gum and candies sweetened with xylitol can cause liver failure even when consumed in very small amounts. Foil and cellophane wrappers can cause intestinal upset or even an intestinal blockage. In addition to planning the best Halloween for the kids in your home and neighborhood, take some time to plan how you can keep your pets safe and happy once the ghosts, goblins, and witches come to your door!